I wrote this in 2003. It was published in our local paper on the Op-Ed page, so my dad got to read it, and I’m glad he did. This is my first Father’s Day without him, and even though I got to have him for 49 years, I didn’t realize how hard it would be. Dad working on a weekend with all of us with him. That was normal. We spent a lot of time in oil fields, watching him fix things. I was suddenly overwhelmed with emotion and burst into tears. For the first time, I felt all the pent-up sadness I had because I had never heard, and probably never would hear, my dad say those words to me. I though a lot about that. Sometimes I would be sad and sometimes mad, and always full of self-pity. I felt I had missed out on so much by not having my dad say he loved me. It seems like one of those basic things kids need to know from their parents, and my dad had never said it to me even once. I brooded over the injustice of that and wondered what I could do to change my father. A few years passed, and I ran into my former co-worker Ken again. I almost didn’t recognize him. Though we were close in age, he looked a lot older. He was haggard and his face was grey. I asked him what he had been up to and he sighed deeply and told me. It sounded like he had an early midlife crisis of epic proportions. He left his wife, dropped out of his church, had a bunch of wild relationships, moved out of state and developed a drug and gambling problem. He had lost everything he owned and was on shaky terms with his family. I felt sorry for Ken, but I felt worse for his kids. This man I had idealized because of what he said to his daughter on the phone helped me to realize that there are more important things than words. My father never seemed to be overly happy or sad or giddy or tired or in pain. He was just a steady force that kept going through life, plowing ahead despite all obstacles. There were things I couldn’t count on my dad for. I couldn’t count on him to say he loved me. I also couldn’t count on him for extravagant praise. When I ran to him with my latest accomplishment, his highest compliment would be to mutter, “That’s pretty good.” I couldn’t count on long heartfelt talks like fathers and daughters had on TV. But what I could count on him for was everything else. When things needed to get done, he took care of them and made it look pretty easy. He went to work every day and came right home every evening. His life wasn’t flashy or adventurous or wild. It was centered around Mom, the five of us kids, the house and the relatives. I am sure that there were times when he would have rather been anywhere but in a little house with six other people and one bathroom, but he never made it seem like that. 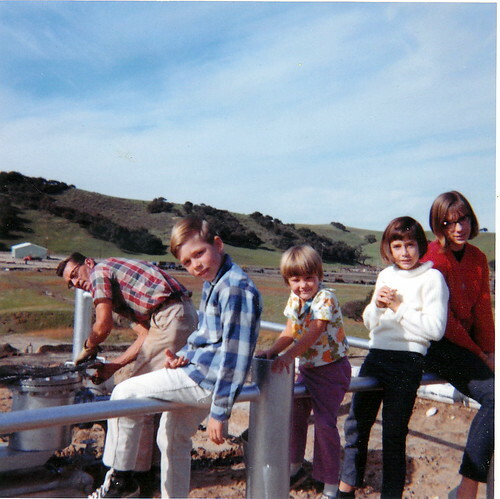 My dad took on his responsibilities without complaining, without wavering, seemingly without resentment. He made sure we had a roof over our heads, clean clothes, food to eat and never gave a hint of what a monumental task it was to provide all that for us. He never seemed to get sick or tired, never lashed out in anger or frustration. When I was a child, that all seemed absolutely normal, but now that I am an adult and am often sick, tired frustrated or grumpy myself, I am amazed at his strength. My dad is a man of actions, not words. He let me know how he felt about me each and every day, and if I couldn’t hear him say “I love you,” maybe it is because I was only listening with my ears and not my heart. Happy Father’s Day to my dad, Bernard Davis, and to all the dads like him, men who care enough for their families to make the small, right choices every day that add up to a life filled with love. What a lovely tribute to your dad. He must have been a good man to have raised a daughter like you. And this is my first Father’s Day without my dad too, and I agree, it is definitely hard. Big hugs to you, Kalyn. Thanks for making me well up over my breakfast cereal :-). A lovely post. beautifully written. you are as lucky to have had him as he was to have you. Yes, and I’m glad to have had the chance to let him know I “got” him. Our relationship changed for the better after that. Whoa! It DOES sound like we’re talking about the same guy! I’m glad you discovered my piece and I’m so happy to have read yours. Like you, I feel blessed to have this very special man in my life! I loved your post. I think your husband is lucky to have someone who understands what he is saying with his actions. I loved this so much, Sue! I didn’t cry but I did think wow — what an amazing man and later revelation for you. I wasn’t lucky in the parent department but that doesn’t stop me from admiring those moms and dads and kids who created families filled with love, even if unspoken.